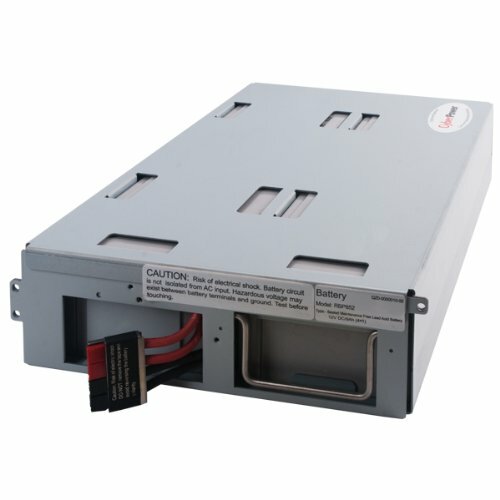 CyberPower’s RB1290X4D UPS replacement battery cartridge restores life to UPS systems with internal batteries that have become weak or completely depleted. The RB1290X4D 12V/9AH (qty 4) batteries are certified to meet or exceed original manufacturer specifications. All replacement cartridges come with leak proof sealed lead acid batteries that are pre-assembled for easy installation into your CyberPower UPS system. Each CyberPower replacement battery cartridge ships with reusable packaging that can be used for delivery of expired batteries to a suitable recycling center. All CyberPower batteries come with an 18-month warranty. Compatibility: PR3000LCDRT2U, PR1000LCDRTXL2Ua, PR1500LCDRTXL2U, PR2200LCDRTXL2U, PR3000LCDRTXL2U. Package Includes: (4) 12V/9AH replacement batteries, replacement instructions, recycling information and warranty documentation, and reusable package for delivering expired batteries to a suitable recycling center.